Surrender document to terminate any commercial lease by mutual agreement includes optional provision for payment by one party to the other and for all obligations to cease. 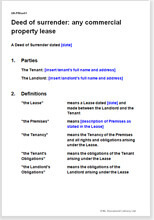 A “surrender” of a lease is the name of the document which is used to terminate a commercial lease by agreement between the landlord and the tenant. For a formal surrender, the document should be executed in the form of a deed as this one is. It may also be used to surrender any other commercial lease.